Articles Archives | MME group Inc. Hot Plate Welding; What You Need to Know. What’s the Weld You Want? The very fact that you’re reading this piece means that it’s highly likely you’re aware of Hot Plate Welding. Good; you’re our kind of person. But is Hot Plate Welding right for your project? Does it provide the very best solution to your problem? There are multiple ways to bond two thermoplastic surfaces; Hot Plate Welding is one of them, along with Glue, Spin, and Sonic Welding to list a few. Before you choose the process that’s right for you, you need to consider a range of factors, all of which could have an influence on your decision. Materials…What’s the most appropriate and efficient process for the materials you need bonded? Hot Plate Welding is certainly one of the most durable processes, but under certain circumstances other applications could provide similar results. MME group will work with your team to help understand the product requirements and testing, then come up with materials and make the appropriate recommendation for the application. Scale…What volume of product will you need to produce to reach a viable price point? This is where you need to find the sweet spot. Hot Plate Welding can often come at a higher price point for lower quantities, but may be the best option based on part geometry, part size, and material selection. MME engineers partner with customers to find the best solution to fit the project’s needs. Testing…Do you need every part fully tested to prove functionality before delivery? Quality in materials and process mitigates risk. MME can work with your team to determine the best testing methods and build testing equipment to your specific needs. Environment…Are you aware of the environment in which the product will be used? In environments of extreme temperatures or pressure, Hot Plate Welding passes every test. But if those factors aren’t in play, other bonding applications may suit the job well enough. Process…Is the process you choose robust and repeatable? Reliability and repeatability are two of the key benefits of Hot Plate Welding. When there is little room for error, Hot Plate Welding is top dog. Choosing Hot Plate Welding isn’t simply selecting an application. The equipment itself must operate at a capacity to produce the results you expect. 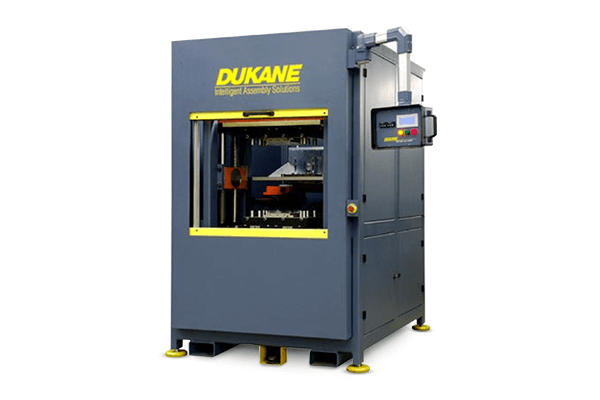 We have two vertical machines capable of contact and non-contact welding, and depending on the size of the part being processed, they have a typical cycle time of somewhere between 20 and 40 seconds. Batteries, fuel tanks, automobile lighting, washer bottles, medical devices…whatever particular assembly challenge your company is facing, we can offer a quick, effective Hot Plate Welding solution. Manufacturing accounts for more than 12 million jobs in the U.S1. It is a critical industry with an economic impact that goes far beyond the manufacturing sector. With higher than average employee wages and the “multiplier effect,” manufacturing is an economic game-changer. In the second quarter of 2015, the average total annual compensation (including benefits, insurance and retirement) earned by a manufacturing employee was $76,8772, whereas, those employed in the private sector earned an average of $45,3693. Manufacturing employees’ higher wages open the doors to a higher standard of living and overall greater spending—money that is put back into the economy. Manufacturing creates a cycle of growth that affects other sectors. As manufacturing grows, it requires more employees, resources and suppliers to support its output. Directly and indirectly, supporting sectors increase their activities, resources and create new jobs as well. According to the U.S. Bureau of Economic Analysis summary provided by the Manufacturing Institute, every dollar input into final sales of manufactured products supports $1.33 in economic output from other sectors4. The effect manufacturing has on other sectors and the economy is called the multiplier effect. No other sector has a greater effect than manufacturing! Manufacturers develop national wealth and power through innovation. The economic significance of the manufacturing industry is impressive while perhaps underestimated. Manufacturing is arguably the main driver of economic growth in the U.S.A. and we’re proud to be a part of its success. Learn more about MME group contract manufacturing services. 3 U.S. Bureau of Labor Statistics – Economic News Release. Sept. 9, 2015. In the manufacturing industry, ITAR registration is the gold standard for abiding by strict security and compliance regulations. ITAR registered companies understand and adhere to U.S. export laws for government projects. MME group is ITAR certified with the U.S. Department of State – Directorate of Defense Trade Controls. ITAR certification ensures that a company operates in accordance with federal rules and regulations related to defense controls. MME group meets ITAR requirements related to company structure, corporate policy, training, documentation and procedures. MME group employees complete training that ensures they understand the sensitive nature of their work. With training and compliance, MME group maintains confidentiality during and after project completion. As a supply chain partner, MME group ensures that its customers will always comply with ITAR regulations; careful attention is paid to the entire supply chain and materials management process. “ITAR certification is just one more safeguard we put in place to ensure high quality manufacturing. We are also ISO 9001 and 13485 certified,” said Brian Bussmann, vice president at MME group. The ISO 13485:2012 certification demonstrates MME group’s ability to adhere to quality requirements and regulations applicable to medical component manufacturing. ISO 9001:2008 addresses various aspects of best-known standards for quality management systems. Cambium Network, a leading global provider of wireless broadband solutions, needed a manufacturing partner to provide plastic parts for their Wireless connectivity device. MME group manufactured the parts, and provided the value-added benefit of utilizing vertically integrated cost-saving solutions. MME group provided a total solution for their customer’s parts project. The Company’s technical expertise in regular plastics, molding and DFMA put them in the position to provide the best solutions up front. MME group negotiated lower prices to purchase coating and raw materials. They bought materials in bulk and coordinated ordering efforts to reduce cost. They also introduced a custom designed shipping box that came in at an overall lower cost. The part was manufactured, shielded, assembled and shipped from the MME group facilities in St. Paul, Minn. Supply chain management handled by experienced MME team members contributed to cost reduction. Turnkey assembly and shipping solutions decreased delivery time. The Company assembled MME group molded parts to the shield, applied logos to the product, and handled all international shipment requests. MME group’s end-to-end manufacturing solutions turned a routine request to manufacture parts into a supply chain management success story. One of the key challenges that customers face is getting to market on time. At first glance, sourcing materials, parts and production, and assembly to the lowest bidders sounds like a suitable approach to minding the company budget. However, this approach is problematic. There is less certainty that a collection of suppliers will be able to deliver on time and maintain quality. Thus, resulting in increased expenses and delays to production. Minimizing supply chain challenges will help get customer products to market faster. MME group is a vertically integrated manufacturer with a demonstrated understanding of the supply chain process. This means we become a trusted partner to our customer. We invest in the project from start to finish. We ensure that lean manufacturing processes are applied. We are experts in supply chain management; we create a seamless supply chain that is aligned and working toward meeting the customer’s goal. Our team works closely with customers to prioritize, manage resources, develop schedules and identify team roles. We work with customers to understand and provide solutions to budget constraints. We incorporate Design for Manufacture (DFM) and Design for Manufacture and Assembly (DFMA) methodology to anticipate manufacturing costs, materials and design early in the process. We use this technology to select the most appropriate manufacturing approach for the product. We apply Early Supplier Involvement (ESI) at various stages of product development from planning to design to manufacturing. Our early involvement and long standing relationship with suppliers allow us to leverage additional experience and expertise. This supports open communication, an on-going comprehensive design evaluation, and determine appropriate program needs for the customer. Vertical integration provides MME group customers with many benefits. Choosing MME group gives customers greater access to experienced and knowledgeable engineering and design teams, resources and more control over outcomes. Ultimately, vertical integration controls costs and helps customers get their product to market faster. MME group’s ability to deliver supply chain management is the key to the Company’s highly regarded reputation for trust, quality and end-to-end integrated manufacturing solutions. Learn more about MME group’s services. If you have questions about how MME group can help your product get to market, please email or call Brian Bussman at (651) 483-0965. There is a growing trend to reshore manufacturing back to the U.S. as companies realize the true costs and advantages associated with onshoring. The turn of the century marks a significant time in manufacturing history. In large numbers companies moved manufacturing offshore. Labor costs were cheaper, the cost of shipping decreased, moving product became less of an obstacle, and international communication became less of a barrier. What companies did not forecast were the challenges to offshoring. Nor, how American manufacturers would leverage the shift to create opportunities for improved equipment, labor and processes. During the past 10 years, American manufactures have strategically and creatively developed competitive pricing solutions. A number of improvements have been applied that do not sacrifice quality, yet, allow the manufacturer to employ higher priced domestic labor. The cost to employ and source offshore is unpredictable. Labor costs are rising in most emerging countries. And currency fluctuations from year-to-year add unexpected costs. Onshore manufacturing is steadily closing the gap on foreign wages. Modern day onshore manufacturers manage resources and provide solutions to budget constraints. Design for Manufacture (DFM) and Design for Manufacture and Assembly (DFMA) methodology is applied and used to anticipate manufacturing costs, materials and design early in the process. New manufacturing technologies and automation are utilized. Cost reduction efforts with a focus on continuous improvement are a mainstay for today’s domestic manufacturer. The allure of manufacturing overseas has lost its luster as offshore customer service delivery has deteriorated. We can all agree that international communication is better than it was 10 years ago. However, it’s not without complications. Communication breakdown, misunderstood direction and poor customer service lead to costly mistakes. An experienced domestic supply chain manufacturer understands the significant value of communication. Shorter production times, reduced error rates and top-notch customer satisfaction are onshore benefits—and cost saving solutions—that many companies realize after they’ve experienced an egregious dissatisfaction overseas. Explaining that something was “lost in translation” takes on a whole new meaning when a misunderstanding affects your company’s production schedule. Onshore manufacturing also eliminates the need for overseas shipping which can result in longer lead times and can significantly increase the overall cost of the product. Unforeseen shipping challenges may occur, and often time offshore manufacturers require companies to maintain larger inventories. Onshore manufacturing reduces the potential for shipping difficulties that could be detrimental to a company’s product launch, reputation and profits. There are also costly landed costs – otherwise known as hidden or unknown costs. Landed costs include taxes, import fees, offshore scheduling and resource management fees. Most importantly, quality is often unknowingly sacrificed. Overseas vendor management and governance has a direct impact on product quality. Companies must trust that the quality systems that are applied in the U.S. are also followed offshore. If a problem arises, a company may have little recourse available overseas. Thus, offshore manufacturing can play out like a costly game of chance. Made in the U.S.A. is more than a label. As Americans, we take pride in what we build. American manufacturing has grown stronger and wiser to overcome challenges faced by offshore competition. At MME group, ‘Made in the U.S.A.’ is a guarantee to customers that quality, price, communication and on-time delivery are never sacrificed. Learn more about MME group’s Made-in-the-USA services or please email or call Brian Bussmann at (651) 483-0965.